Just as those who lived in the pre-Photoshop age depended on photographs for evidence, people have been relying on video recordings as damning proof of someone’s innocence, although the birth of AI-altered clips, known as deepfakes, shows that the line between truth and fiction is starting to get fuzzy. 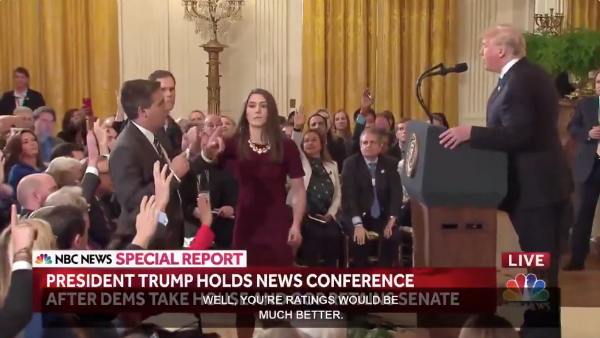 Sarah Huckabee Sanders, Press Secretary of the White House, posted what appeared to many as a butchered clip of a female White House aide stepping in to grab a microphone from CNN reporter Jim Acosta. “We stand by our decision to revoke this individual’s hard pass. We will not tolerate the inappropriate behavior clearly documented in this video,” Sanders defended. However, when Sanders’ snippet was placed aside the video published on national television by NBC News, viewers believed that the White House’s version had been altered for dramatic effect to make it look like Acosta had “karate chopped” the intern’s arm. A forensic investigation launched by the The New York Times found that the White House had reposted a video from Paul Joseph Watson, a contributor of Infowars, which is a conspiracy site that is banned from networks such as Facebook and Twitter. The clip being shared by the WH Press Secretary and Infowars has been slowed down then sped up to create the illusion of a karate chop.